On the 8th July 2017, Portsmouth brewery and dinosaur aficionados Staggeringly Good held their much-anticipated launch event of their new double IPA, Jurassix. This was no ordinary beer launch, however, as they had teamed up with some of Portsmouth's most exciting creative talents to produce a six pack release featuring limited edition can art. The launch took place at local tattoo and art gallery Play Dead Studios on Highland Road, Southsea. The event itself was massively popular and it was fantastic to see such a large number of people attending. This reflects massively on the success of both Staggeringly Good, who in a very short time have produced some amazing beers (Hop Rod is a personal favourite). It's also an endorsement for the local Portsmouth artists who have contributed greatly to the cities artistic and creative culture. We arrived just after 6pm and there was already a pretty heaving queue (the event started at 6pm). The offer of a limited number of signed cans by the artists had made sure that people got down there early. Outside of Play Dead Studios the revellers were out in force and were being kept entertained with food provided from local eatery Jags@119 and beer provided by Staggeringly Good. The usually limited Hop Rod and Hole in Time were on offer for this event. The queue went surprisingly quick and we were salivating at the thought of tasting this new DIPA. Once inside we were able to take a look at some of the artists work that had contributed to the can designs and pick up our six packs of Jurassix DIPA. Hooray! My Dog Sighs is Portsmouth's biggest name in street art. His huge, awe inspiring murals can be seen throughout the city and he's had a huge influence with his Free Art Friday initiative which sees work given out freely on a regular basis. My Dog Sighs reoccurring eye motif can be spotted all around Portsmouth and he's also been commissioned for work around the world. It was no surprise that the Jurrasix featured another spectacular eye design called Staggering Dog. My Dog Sighs had also produced a fantastic eye mural which featured on the outside of the Play Dead Studio. Fark's colourful creations can be found graffitied around Southsea, particularly in the Osborne Road area and on the now defunct Grovesnor Casino, bringing some creative urban art to the area. I'm personally a big fan of the 'Be Excellent to Each Other' pigeons. Oh Yeah! just about sums up Jurassix personally (it's bloody great). If you want to check out more of his work it's definitely worth a trip to the Tea Tray in the Sky which he also runs. I've spotted Midge's work in paste-ups around Southsea, featuring brilliant and surreal creatures. This can features a fantastically detailed mammoth design. For some reason, this can fills me with sadness, probably because mammoth's no longer walk among us. Fortunately, the actual can was filled with delicious DIPA. I'm most familiar with Samo's work from the epic tattoo that adorns my partner's leg! It was no surprise then that an actual leg tattoo of a triceratops also features in this can art. The concept is brilliantly realised in Samo's watercolour style on a flesh coloured can for authenticity. M-One produces some of the amazing street art found sprayed and stencilled around Portsmouth and Southsea. The geometric animal design produced by M-One are my personal faves, both beautiful and impressive. I was really pleased to see that they had gone for a classic design for their can, recalling the days of Jurassic Park with an iconic T-Rex design. I've followed Ooberla for a while on Instagram and love the crazy, colourful and cartoony creatures that come from this artists mind. I can't help but think of the squidgy clay creatures of The Trapdoor fame (90s kids will remember...). 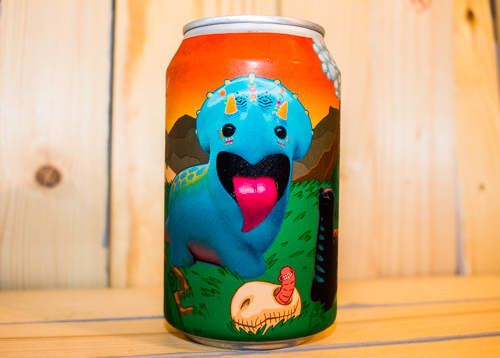 This can was designed in collaboration with Ooberla and Stu Linfield illustration who's fun, surreal work I've often seen featured at Southsea events. The beer itself doesn't disappoint and this shouldn't be a surprise from the Staggeringly Good guys that have consistently been putting out some top notch beers for a while now. Cracking open my first can, I was initially hit with a sweet, juicy aroma. Jurassix packs a powerful hoppy punch, with a sticky, resinous taste. This indulgent DIPA is like drowning in the pre-historic sap from a tree as it encases you in amber. At 8% this is a beer that you could quite happily nurse however you will probably find yourself cracking open another. Overall, an excellent and very moreish beer.